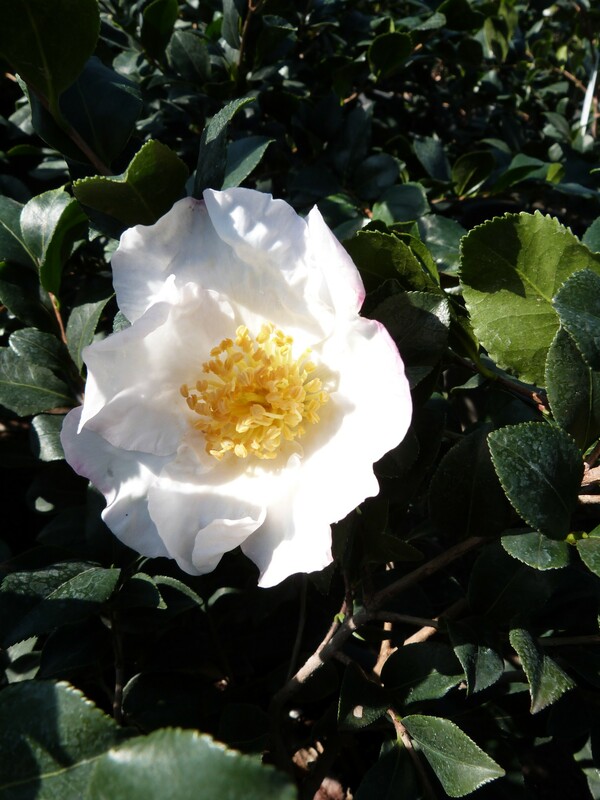 The flowers of sasanqua camellias may not be as large as their Camellia japonica relatives,but what the flowers may lack in size they typically make up for in a prolific display. From early fall to the end of December, ‘Setsugekka’ has numerous semi-double blooms of pure white with ruffled edges and a group bright yellow stamens in the center. Each blossom has a delicate, earthy fragrance. Slow growing, but eventually spreading eight to ten feet, its branches cascade in a semi weeping habit with shiny, dark evergreen foliage. Growing and blooming best in partial sun or in morning sun filtered through trees, take care to protect camellias from hot sun in the late afternoon which can damage the foliage. Good drainage is essential as is a healthy level of organic matter and a low soil pH level. With all its basic needs met, ‘Setsugekka’ will not experience many pest or disease problems, but in poor drainage or low light it can become susceptible to scale insects or aphids.